If you were a Budgie fan in the 70's or in the 80's you would find yourself in two different camps. The band changed over the years, not so much as evolved - ever applying themselves to the target market of the band they were currently emulating. The "classic" period would see them in slavish imitation of BLACK SABBATH, the eighties - a kind of generic pop-metal and a reduction in identity. Where they became what they truly were: An accomplished, hook-happy, British rock band was on this album: "If I Were Britannia, I'd Waive the Rules". If a true evolution can be creditted to the band it is here in the full eclectic enjoyment of songs that parade hard riffs, jazzy swing, bright melodies, and a new economy of structure. The playing is tight, and the singing effective even at larynx shredding height as on the title cut (Burke's got a very satisfying "fur" in the upper range). What's missing is the protracted guitar solos of the previous "classic" period - and to my ears that's no great loss. Bourge was a diabolical composer of riffs, as a soloist he was undistinguished - a kind of lower-rent Iommi. I like the run of the entire album. Well programmed enough to invite repeated listenings. The epic closer "Black Velvet Stallion" is however less effective, the riff needing more detailed development over the course of the song and not right at the end. The rock offerings are all pretty solid with varying guitar tones and good dynamic changes in the vocal. The sometimes derided ballad - "Opening Doors" is a particular delight beniffiting from a fine melody and vocal despite the dated TRAFFIC sounding 70's synth solo. 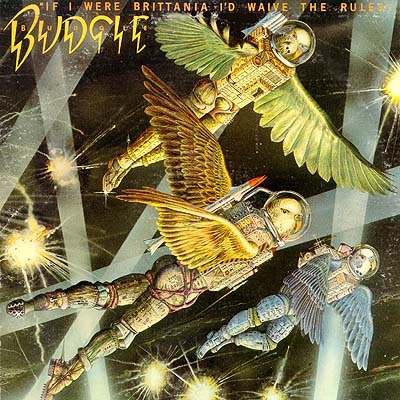 A solid effort that finally marked Budgie as a band with enough originality to be taken seriously before slipping back into flavour-of-the-month.